There’s barely a distinction between works on paper and works of paper in “Paper Paradox,” the 10-artist show at the Carroll Square Gallery. Such mixed-media pieces as Mei Mei Chang’s “Breathing Landscape” combine drawing, painting and collage, while Suzanne Desaix’s “Cornucopia” and Alice Quatrochi’s “Rewind” are fully sculptural. Several of the pieces use artist-made materials, drawing on Japanese traditions of washi (handmade paper) and wabi (rough-hewn simplicity). 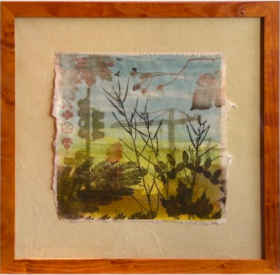 There can be an environmental twist to this aesthetic, as when Patterson Clark makes paper, ink, frames and printing blocks exclusively from trees and plants that are invasive to the Washington area. As might be expected of such an exhibition, the forms are wispy and the colors muted. Image and backdrop often seem to merge, as in Alexis Granwell’s “Flood,” which arrays yellow and gold dots and stains on cream-colored paper. Peter Winant’s “Chalk Lines” draws parallel bars of powdery, grayish pigment across grainy, milky-colored paper. The most involved work, Ceci Cole McInturff’s “Thought Are Things,” collects found and made specimens into a six-volume sculptural book. Everything you need to know may be digitized these days, yet paper and books have a tactile appeal that can’t be replaced.